Yesterday all new Chatwee arrived. New chat system brings a handful of new features, addons and bug fixes including Single Sign-On, automatic guest name panel for auto logged users, new smileys, spell check for message input, additional set of color pickers and right-to-left language support. Let’s take a tour of all new features and learn how to you use them to engage even more. This is our November blockbuster! 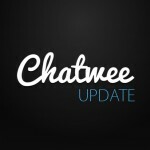 From now thanks to new Chatwee API our chat platform can be fully integrated with your users database so they can log in only once and access both services. Single Sign-On (SSO) is available only in December as a feature for all subscribers. Please contact us via this contact form and request to enable it for your account. 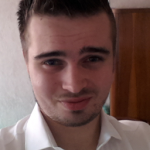 You will recieve a full installation manual so you could implement it easily into your website. Considering the fact that users which are automatically logged in are being provided with random names, we have decided to facilitate the process of changing guest name on the right one. 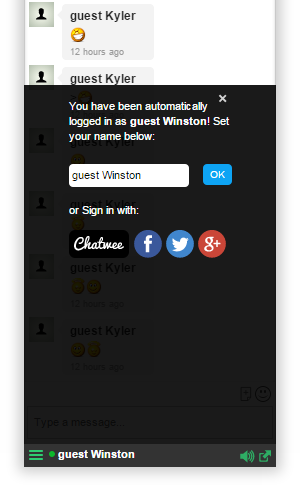 If a user is logged into the chat automatically, he is being welcomed with a panel that informs him about his guest status and suggest changing the name to the desired one. First tests shows that this way of starting guest session is pretty much clearer and less confusing. This feature has been requested many times and lately on Chatwee support forum. Maybe it is not a big thing, but helps in fast typing, especially for those who appreciate a clean and error-free spelling. Spell-check can be enabled/disabled as well in Messages tab in Customize section. Inner Background Color allows you to set a color of main background for both users and messages panels. Second Inner Background Color style less significant elements which are also considered as a wrappers for content like additional information and buttons. Chat bubbles color picker ensures that you can colorize speech bubbles if settled. Additionally, we have removed unnecessary shadows and borders to make them look cleaner and for performance reasons. Chatwee uses Mazes Mini emotions pack. To date, only 10 were available emoticons, but at the request of one of our clients we went the whole hog. 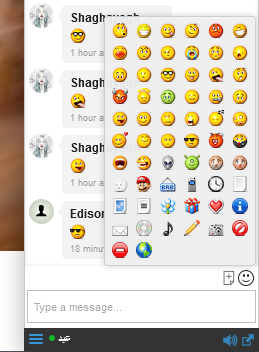 From now on, during the chat session users can sort in a full set of 62 beautiful emoticons and smileys. Please note that smileys can be enabled/disabled at all, so it’s your call either to use it or not. Due to the fact that our chat system supports right-to-left languages, we decided to add the appropriate styling. Now the chat window with Arabic, Kurdish and recently added Persian localization settled presents itself on the screen as below. 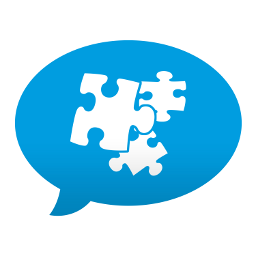 Our dev team is not slowing down and focuses on issuing a separate chat rooms feature. The functionality provides for the possibility of adding a separate chat room by administrators and/or even by the user himself, so that a single chat could be divided thematically into sections or departments. We always look forward to your feature requests, so if you have any killer ideas – do not hesitate to share them in the comments, via chat or contact form. Wishlist can never be too long!